August 9, 2015 - Angell Park Speedway - Sun Prairie, WI: Last race for me at Angell Park in 2015. Took the heat race in dominating fashion. Taking the lead from the 6th starting spot at the end of lap 1 and not looking back. Another super fun race. Had to start in 12th place like normal for me. Got up to 3rd pretty quick with the top 2 guys spread out. I was able to track down 2nd place and take it before a cuation came out and bunched us up. After falling back to 4th on the restart I was able to get back on the leader. Running side by side for several laps. I was able to take the lead off turn 4 but a caution came out right away. Lost my spot and was suppose to restart in 2nd place. Unfortuneately had a rear suspension part failure under caution and I had to pull off. Not the way I wanted to end my dirt season. July 25, 2015 - Beaver Dam Raceway: Decided to make a return to Beaver Dam Raceway for one last time in 2015. The night started off great. Moved from 5th starting place in the heat race to the lead before the first lap. Slowing pulled away until a caution with two laps to go. The restart went smooth and I was able to take another heat win. The feature was a fun race. Started 5th had to work hard to get the lead. A couple cautions made the race more exciting. Really had to push at the end to hold off the other competitors. Was able to take home another clean sweep at Beaver Dam. Even ran the fastest lap in Legends to make the victory even sweeter. July 5, 2015 - Angell Park Speedway - Sun Prairie, WI: Part 2 of a double header for me. Fixed the car and set it up for racing at Angell Park trying for more wins. Ran a good heat race coming for the back up to 3rd place finish. The car was running good felt good about my chances in the feature. I believe I started 9th in the feature. I had to work the bottom to get up front even taking the lead before the halfway point. I tried my best to stay riding around the bottom figuring that was where the car was working the best that night. But with a few laps to go I lost the lead. I just couldn't get off the turns as good and faded. Ended up taking 2nd place for another good solid run just short of the win. July 4, 2015 - Beaver Dam Raceway: Decided to show up with the car on the 4th of July at Beaver Dam, first visit since April. It started out well winning another heat race. In the feature I had to try and climb through the field to get up front. A couple laps in I made contact with another car going into turn 1. I could instantly tell something was bent on the right front just didn't know how bad. I keep running making my way up to 2nd with a very poor handling car. With 6 laps left the caution flag came out. Once everyone slowed down I could really feel how bad the car was damaged. The right front wheel was shaking pretty bad. A track official had me stop so they could look. They found a broken steering arm bolt and had me pull off for repairs. With the limited amount of time left in the race I didn't get back on the track to finish. June 21, 2015 - Angell Park Speedway - Sun Prairie, WI: Another fun night at the Prairie. Had to work hard in the heat race but made the last lap pass off turn 2 to take the win. The feature was a fun battle having to start 11th had to pass a lot of cars to make my way forward. I made it up to take another 3rd place finish right at the end. 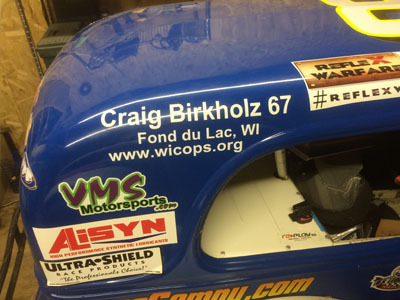 We did something special and talked with WI COPS and ran the rest of the year with a fallen officer on the car to try and raise awarness for the organization. June 7, 2015 - Seymour Raceway: First time visiting Seymour Raceway. I generally prepare for a new track watching races or in car videos from other racers at the track we are going to. I could tell that the track was going to get real slick and fun. Heat race put myself and my brother into a battle. Challenged him for the lead for the whole race just couldn't get by him. Seemed like nothing was wrong with the car. A few minutes before lining up for the feature we discovered a major exhaust issue. At that time my dad and uncle ended up repairing it just in time for me to take my 12th place starting position. Starting 12th on the outside I had a plan on taking the highside from the green. I went flying high in turn one but with no grip anywhere on the track I slid into the wall and lost 5 or 6 spots. I went into the next turn just feeling the car out seeing if I broke or bent anything. Fortunately for me the car felt fine but now I'm 17th in a big hole with no yellow flag. I spent the rest of the race running every line on the track getting through traffic. Made it up to 3rd spot with 2 laps to go. Ran out of time and tires to finish off the race. Had nothing left after fighting up there. Took home a unlikely 3rd place finish. I would like to race this track again if they bring us back. 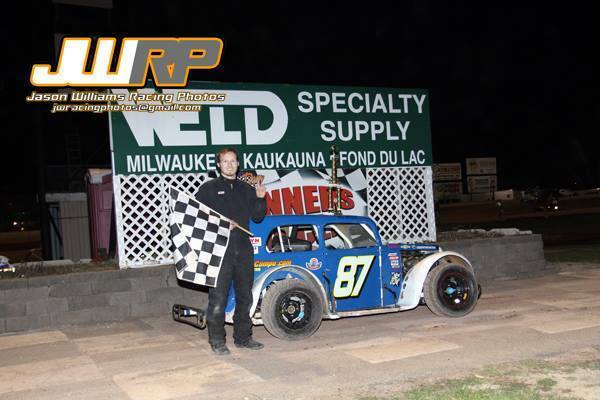 May 31, 2015 - Angell Park Speedway - Sun Prairie, WI: First race in over a month for the DJ Ross Racing LLC #87 Legends car. This one lands us at Angell Park Speedway. I'll start off saying this is one of my favorite places to run. The history of the track, and the challenge of setting the car up right here is always fun. Started the night off after starting 6th in my heat race took the lead early and never looked back taking the win. I had to to start the feature 12th because the last time I raced I won the feature. It didn't slow me down any. Using the highside and middle of the track to work around cars. It wasn't until lap 15 I got the lead off turn 2 using the high line. The next lap into turn 1 there was a four car wreck taking out Ethan and Austin. That left me restarting in the lead with 4 laps to go. I decided to run the bottom knowing no one could go around the outside. Held the lead and pulled away taking my 2nd feature win in a row. And my 2nd feature win at Angell Park. The video below is provided by Mech Racing a view from the stands. 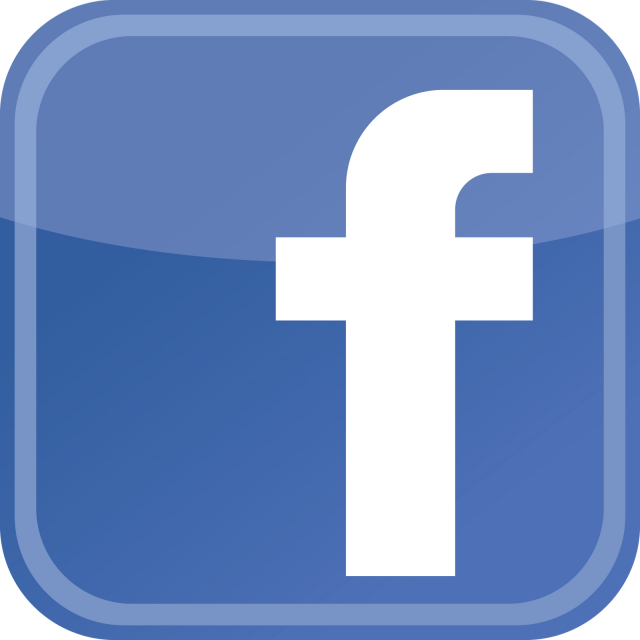 May 28, 2015 - Partnership News: DJ Ross Racing LLC is proud to anounce their support of The Gathering Source a Food Pantry and Resource Center serving all residents living in the Dodgeland School District, including Reeseville, the township and village of Lowell, the township and village of Clyman, as well as Juneau. DJ is attempting to raise awareness and funds for the organization through his racing. Donations can be made directly here. April 27, 2015 - Beaver Dam Raceway: Start of a new racing season. First event up was the Jim Wipperfurth Memorial with the IRA Sprint cars. After a 6 month long offseason it was time to get back on track. It was one of those rare nights where things just went right. After starting 6th in the heat race, we moved past everyone to take the checkered flag. This put us in the 11th starting position in the nights Feature race. DJ patiently worked his way up front. Using the highside mainly. It wasn't until 3 to go he actually took the lead and secured the victory. A sweep on the night for the 87 car. Next planned race will be 141 Speedway May 24. Grandstand Video recorded the feature. September 27, 2014 - Luxemburg Speedway: New track for us with a big purse payout $500 and $75 to start. 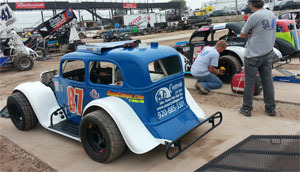 I made more adjustments after last racing Sept 13 at Beaver Dam to try and help this car turn. We started 5th in the heat and got up to 3rd but after a couple laps I couldn't hold the bottom and ended up dropping back down to 5th missing the transfer spot. We made a trackbar adjustment, took some wedge out, added stagger, even grinded both rear tires before the feature. I knew with a 14th place starting spot I had a lot of fast cars in front of me. All the changes made were good ones. Wish I would have went a little more aggressive on the same changes. I was able to slowly work through the pack and finish 7th. Could have used a caution or two to bunch us up, had a top 5 car without a doubt. Feature race with a 3 wide salute to Scott Semmelmann in the beginning. September 20, 2014 - Beaver Dam Raceway: A tragic accident ivolving sprint car driver Scott Semmelmann in turn 3. A donation fund has been setup for his family. Scott Semmelmann Fund Highly encourage making a donation of some kind to his family. 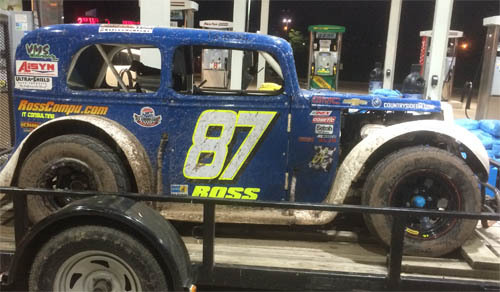 September 13, 2014 - Beaver Dam Raceway: The return of the #87 Legend at Beaver Dam Raceway. Even though I managed to finish 2nd in the heat I could not get the car setup the way I have in the past at Beaver Dam. I struggled with it the full 20 laps of the feature. Started 12th and only got up to 8th. Left plenty of room for improvement. August 31, 2014 - 141 Speedway: My favorite track for Legends cars on dirt. This small 1/3 mile oval in Francis Creek, WI is where I got my first heat and feature wins in 2014 with Ethan's #54 Legend back on Memorial Day Weekend. I was even more excited to return with the car we put together in the weeks leading up to it. Ultimate Racecars re-clipped the front of the car. Dano's Performance checked the engine over. This thing has the same powerful motor we first used at the Dirt Nationals in 2013. The car was put together by myself and my dad helped me finish it. With fog off in the distance we were short on time for visibility. That meant no hot laps for me. Brand new car never seen the track or road yet. Luckly drew 2nd in heat 2. Took the lead from the start and wouldn't give it up. The car ran very well for the first time on the track. Here is the video from the heat. We started first with the RossCompu.com #87 Legend. Jumped out to an early lead. After 3 or 4 laps the car really tightened up and I couldn't go through the turns. By lap 5 I could smell rubber from the fender hitting the right rear tire. I pulled off not wanting to risk any further damage. Checked the pressure in the right rear tire and it had lost over 7 pounds of air in less than 10 minutes. Unfortunate problem for what was a great night. First time at the track with the car we built in August. 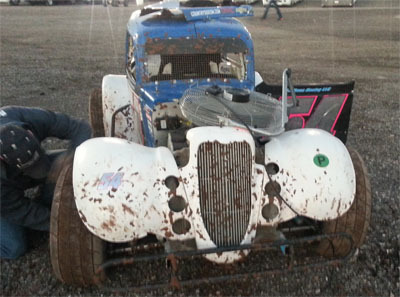 July 27, 2014 - Angell Park Speedway: Another solid start to the night in the #54 Legends car. Had to change a broke header pipe before the heats. Discovered it at the track and it was the close to the minor power loss Ethan experienced the night before. Car was good on the greasy surface the heat race provided. Started 2nd and finished 2nd. We were much better in the feature. Grabbed the lead on the first lap of the race and held it almost 3/4ths of the race. Just heated the right rear up a little to much and a few cautions bunching us back up worked against me. Ended up dead sideways off turn 2 and lost the lead. Tried to fight back with the #55 but we caught a much slower car. The lap car ran the #55 up the track I shot for the bottom. The car we were trying to put a lap down came down and made slight contact with the right front. I just barely brushed a infield tire with the left front but it took us instanly out of the race. Broke a tie rod, bent steering arm and the brand new header got punched in. Not the way I wanted to end my run of 3 races at Angell Park in 2014. July 20, 2014 - Angell Park Speedway: Great night of Legends racing at Angell Park Speedway. This is a great one to watch. Heat race went great leading 7 of the 8 laps and having a full straightaway lead to end it. The feature had a very close 5 car battle for the lead. I was fortunate to use the top, bottom and other cars to my advantage. Came on 2nd on the leaders bumper out of turn 4. Would have loved to get the feature win here again, just came up short. June 28, 2014 - Beaver Dam, WI: I had no plans of running the #54 at Beaver Dam Raceway with Ethan going for the championship, but plans changed when an illness kept Ethan from racing. We were the support class again for the World of Outlaw. The heat races and features for Legends got cut short again just like Wilmot. The 6 lap heat race lead to 3rd place finish after starting 8th and another bent front bumper. We didn't have a lot of time to prepare the car for the feature race and I failed to get a look at the track before the race like I usually do. I made adjustments the car like I normally would going to a feature and missed the setup. I started 11th and wasn't able to go anywhere. I ended up finishing 12th in the 15th lap shortened feature. June 22, 2014 - Angell Park Speedway: The weather almost washed this race night out. We ran as a support class to the USAC Sprints and Badger Midget series. My first race at Angell Park since the 2012 season. Luck of the draw had me starting 3rd in the feature out of 18 cars. I tried the high line in hotlaps but there was no grip up high. I had to stay low the entire 20 lap race. It worked out for me as I finished exactly where I started in the 3rd spot. Video shot by my youngest brother Luke. June 12, 2014 - Seymour Speedway added to the schedule on Sunday August 10th! June 1, 2014 - Angell Park rained for tonight. May 25, 2014 - Franscis Creek, WI: Memorial Day weekend racing. Last time I raced this weekend two years ago I started 8th in the heat and feature at Angell Park and won both races. Lucky for me i had a similar day at 141 Speedway. Started 7th in my heat race. Slowly worked through the field and took the lead with two laps to go. I had to start 8th in the feature. Took the lead around lap 5 never to give it up again. Had to drive hard on some late restarts but I held on for the victory! Here is a video of the Feature. May 9, 2014 - Wilmot, WI: A night of firsts. First night in the #54 car prepared by Ross Brothers Racing. First time at Wilmot Raceway. We were the support class for the World of Outlaw series. The heat races and features for Legends and Micro Sprints were cut short. The 6 lap heat race lead to 3rd place finish and a bent front bumper. We were only given a few minutes to prepare the car for the feature race. My dad and Ethan changed the bumper and made the changes I wanted to make to the car. I over adjusted the car and struggled to a 6th place finish in the 15th lap shortened feature. May 2, 2014 - Updated the schedule to show which races I will be driving this season. April 3, 2014 - Throw back Thursday! First feature win. July 16, 2011 Beaver Dam Raceway. February 17, 2014 - Still looking for marketing partners for car this season. Contact me today! January 7, 2014 - DJ and Ethan have entered Champion Spark Plugs 'Search for a Champion' contest. Please vote for each driver daily. Here is DJ's Video and this is Ethan's Video. Thank you! November 1, 2013: Editing and re-working the website. The old news page can be viewed here.